All's fair in love and war, and when you combine the love and passion of food with the war of competition, you still somehow end up with everyone winning. 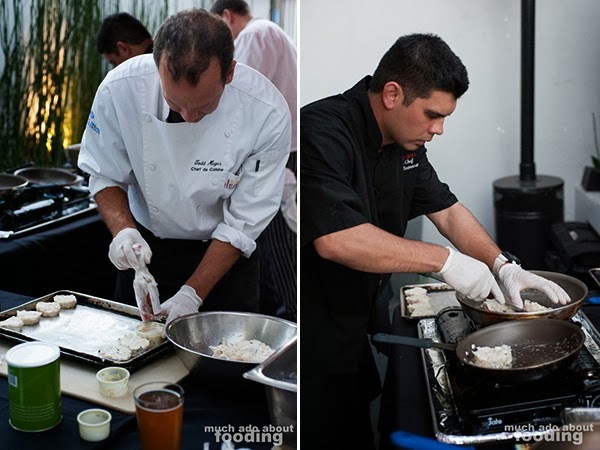 We gathered with 50+ other guests on September 30th at Scott's Restaurant & Bar to watch their second All Star Edition Chefs' Battle (the first one had been held September 9th), a battle pitting chefs from various locations against each other using the same ingredient. 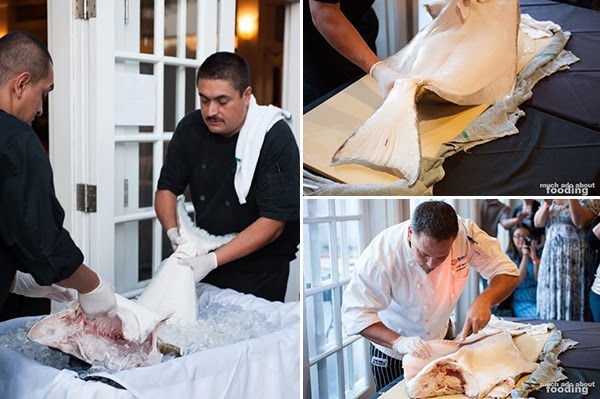 The night's competitors were Scott's Restaurant's own Chef Mike Doctulero, Chef Peter Phan of Seacliff Country Club, and Chef Todd Myers of Newport Meat. Everyone was seated in a large dining room and expectant of star dishes. 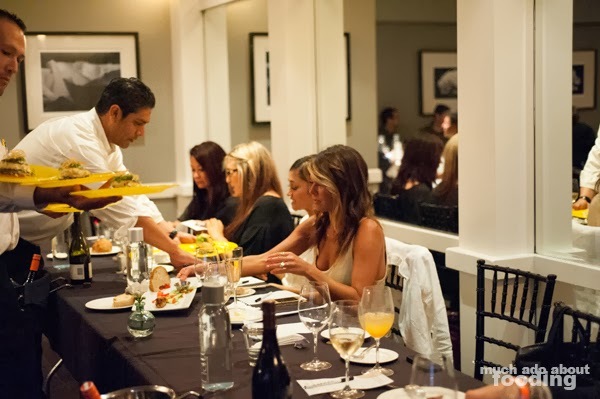 Each guest would receive a taste and have the ability to cast a single vote while a panel of judges from the OC Restaurant Association, Riviera Magazine, and Baker Party Rentals would cast several votes based on different categories. 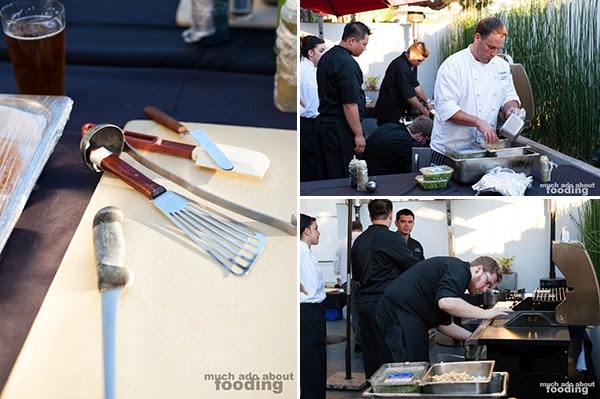 Music played as the chefs prepared themselves for their battle against each other outside in the patio. Complications during the night with this area, unfortunately, included a lack of lighting which was only resolved by non-working assistants holding smartphone flashlight apps over the work stations. We also only managed to get a a few shots in because of this hindrance. The shared ingredient between all of the competitors that night? 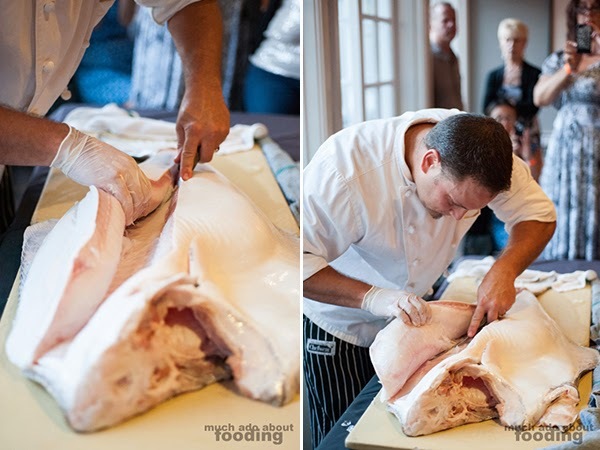 A gorgeous 50 lb Alaskan halibut, brought out whole from a cart of ice. This was deftly sliced at by each chef to get their share of the meat while the audienced oohed and aahed on. The first competitor for the night was Chef Todd from Newport Meat. He got to work right away and with the ingredients set out on the table already, we figured that they knew the ingredient ahead of time. How else would he know what exactly to bring to the table? Each chef happened to have separate colored plates for the dishes as well so guests distinguished Chef Todd's by its bright yellow. 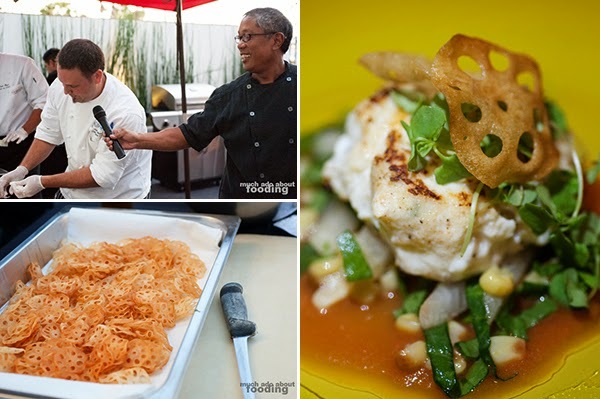 He put together a halibut cake (in the style of a crab cake) bound by ricotta cheese and accompanied by a jicama corn salad in lemon basil vinaigrette topped by a fried lotus root chip and microbasil. The judges seemed to like the texture of this one but some of the audience didn't. We found the corn salad tasty but the ricotta overwhelming the halibut which was a shame considering the beaut of a fish that was carved up! The light was quite low by the time the outdoor workstation/kitchen was cleared out so our pictures became sparse after that point. Our favorite of the night came atop brilliant turquoise plates and in two. 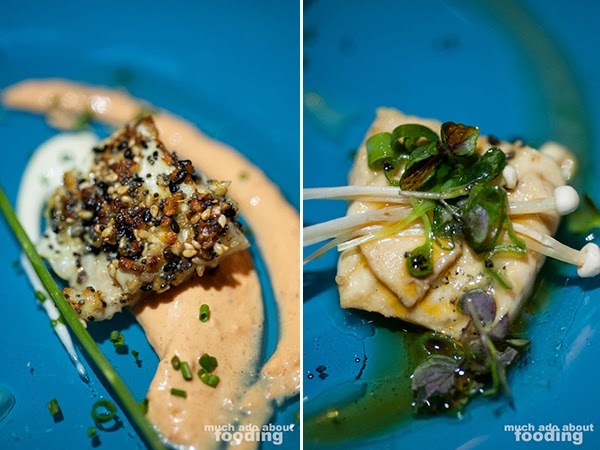 Chef Peter of Seacliff Country Club opted to tantalize us with two bites of halibut prepared in vastly different ways but both were easily welcome. 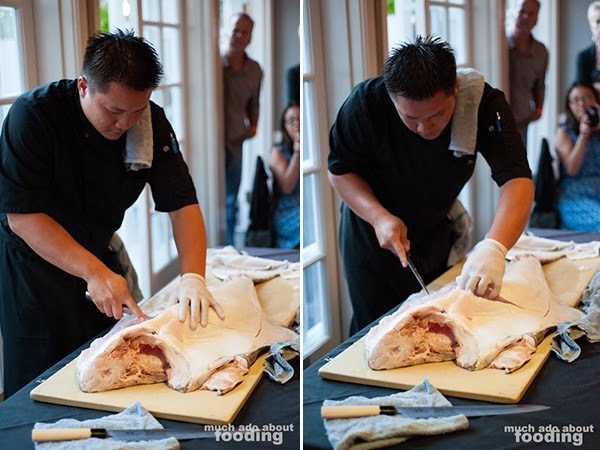 With a nod toward his Jewish fiance and family, he prepared one part of his dish by creating an "Everything" crusted halibut (exactly as it sounds - like an Everything bagel) with chives; his other part was a sake soy poached halibut with daikon sprouts, enoki mushrooms, shiso leaves, ginger, and hot sesame oil. The crusted halibut had a satisfying crunch with each bite and a wonderful accompanying sauce. The poached halibut was absolutely Japanese inspired with its ingredients and a flaky delight; I really enjoyed the use of hot sesame oil to top it all off. 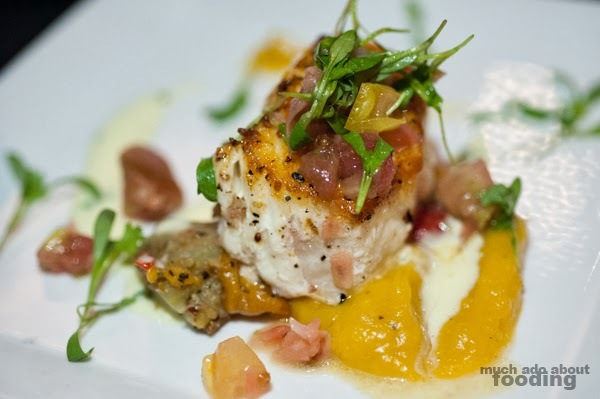 Chef Scott followed up both of the chefs' creations with his ingredient-heavy truffled halibut, seared on high and paired with Shiitake mushrooms atop butternut squash puree and sundried tomatoes, topped with an heirloom tomato salad. Does simple not quite do it for any of the chefs? 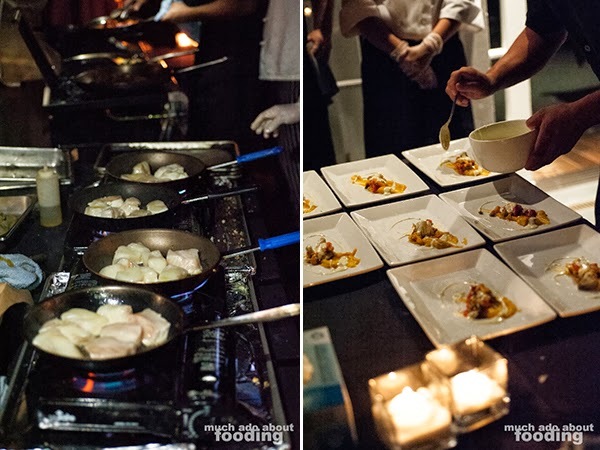 There were certainly plenty of ingredients used throughout the night. We found this one just a bit too confusing with too many flavors at play but it certainly looked presentable. After all of the dishes were presented, voting papers went out to everyone, and we deliberated carefully on the competitors. 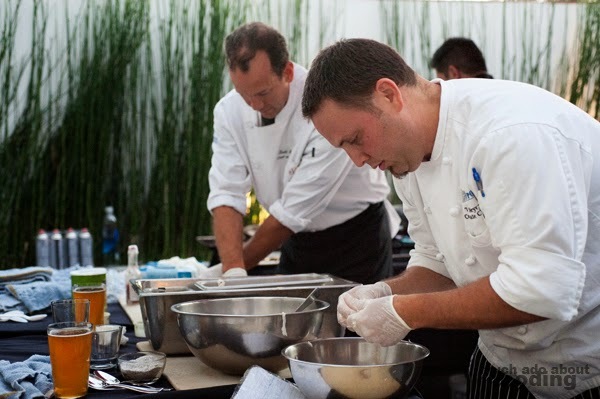 The audience's votes ended up with 29 Chef Peter, 20 Chef Mike, and 14 Chef Todd. It seemed an easy win for Chef Peter but then came in the judges' comments and votes. It then tied out at 37, 37, and 24, respectively. 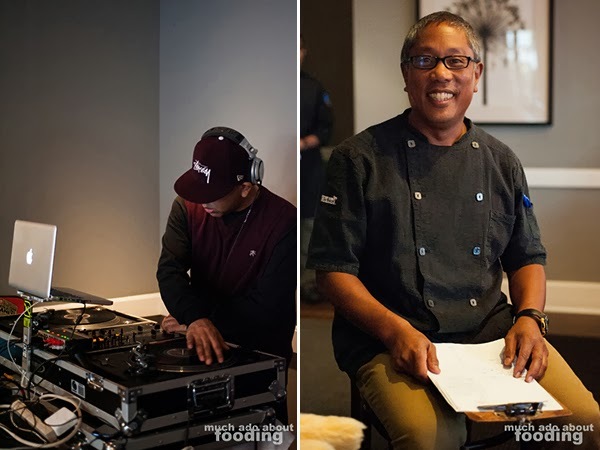 The judges were then asked to cast just a single vote between the two and with a final tally of five votes to Chef Mike and two votes to Chef Peter, the winner that battle was announced. 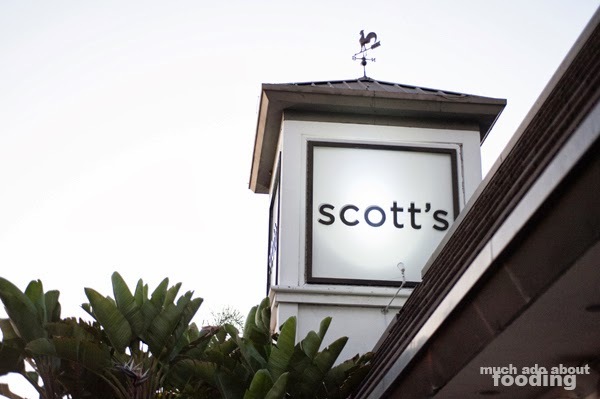 Chef Mike defended his home court at Scott's Restaurant & Bar! 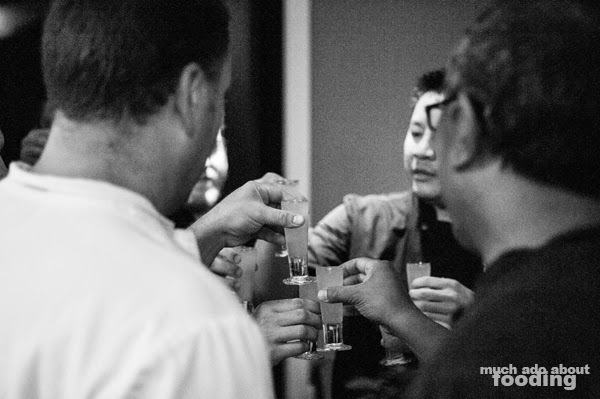 Because it was a friendly competition, the chefs merely cheered for each other and shared shots after the show. Congratulations to everyone for even being a part! 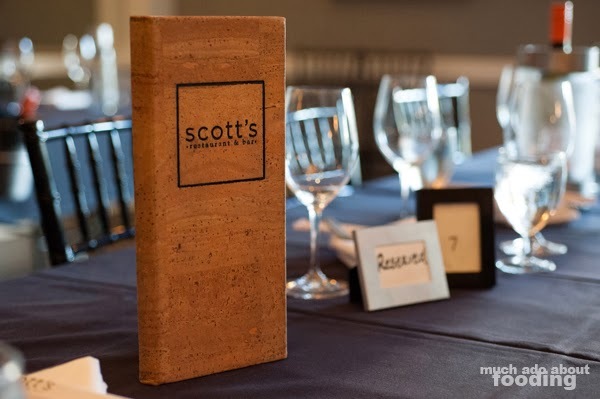 If you are curious, Scott's does hold these dinners as fundraisers in the community, having previously worked for The Grain Project and Soledad with these competitions. They certainly are community-oriented, and we're sure that more will be coming to this restaurant in terms of chef battles. After all, who doesn't like seeing whose knife is pitting against whose? Photography by Duc Duong. More photographs can be found on Facebook here.